According to WebRoot’s announcement, they decided to replace Spy Sweeper with Webroot SecureAnywhere AntiVirus. This program was filled with Spy Sweeper’s ‘Protection against spyware threats’ feature. However, it has also been filled with advanced capabilities, such as ‘Identity Shield’ that protects people’s personal information, capability to identify unsafe links, etc. If you’re an existing Spy Sweeper’s customer, you will be capable to add your remaining subscription time to your new subscription. Webroot Spy Sweeper is one of the highest-rated spyware removal and real-time protection solutions available on the market. This product uses an effective, unmatched scan engine, accurate parasite detection techniques and more than a dozen special monitors. All this together with free frequent updates and user-friendly interface make Spy Sweeper one of the best spyware removers available. This program provides reliable and very easy-to-use protection from practically any kind of privacy and security threats. 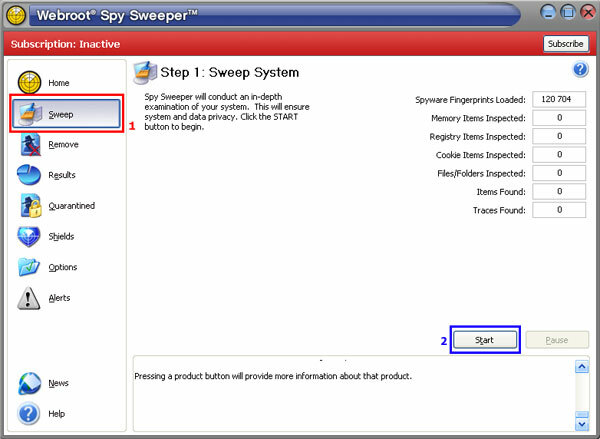 More information about the product can be found in our Spy Sweeper review. 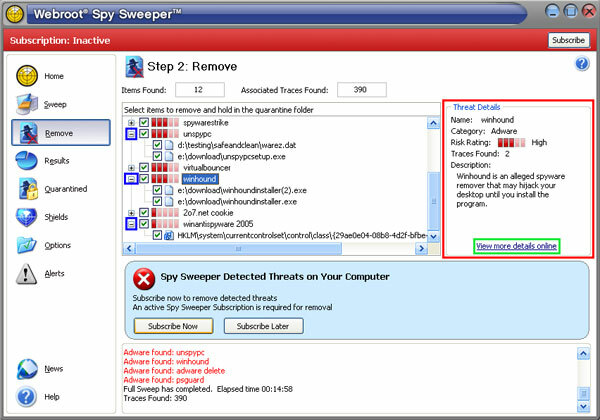 The following guide thoroughly explains how to use Spy Sweeper in order to get rid of spyware, adware and other dangerous parasites. 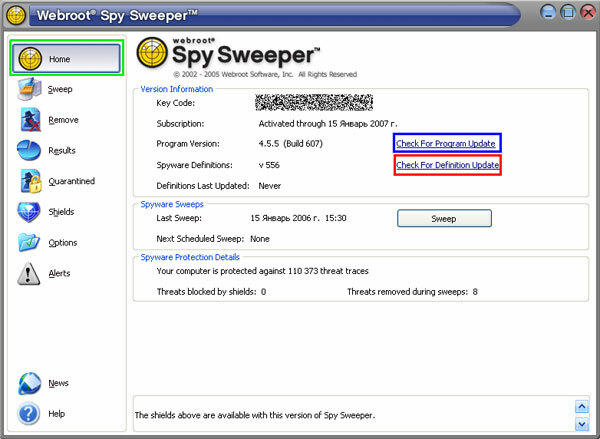 Spy Sweeper is a paid commercial program that costs 29.95 dollars. However, you can try it out for free by downloading the limited Scan Version from the official web site. The current size of the Spy Sweeper 4.5 download is about 9MB. It should not take more than ten minutes. Now you can install the program. Double-click on the downloaded executable file to start the setup. Read and accept the license agreement and select the type of installation. Custom will give you more control on the setup. You will be able to select the installation folder, choose shortcuts to create and set the installation wizard to perform few additional tasks. However, all this can be done later, so most users should select the Typical setup. Then the setup will ask you to provide your e-mail address. This address is required to complete the installation and register your product. You can also choose whether you want to receive important notifications, technical support alerts and other news by e-mail. 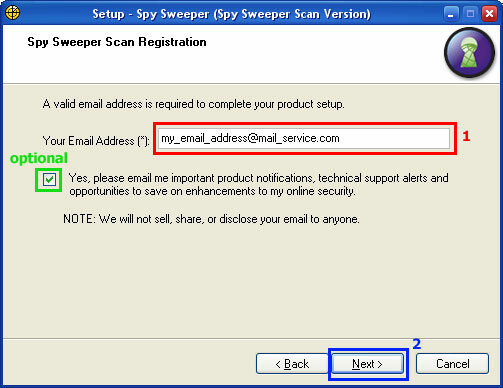 Although you can continue the setup without providing an e-mail address, it is a generally good idea to enter it, unless you are installing Spy Sweeper only to try and test it. 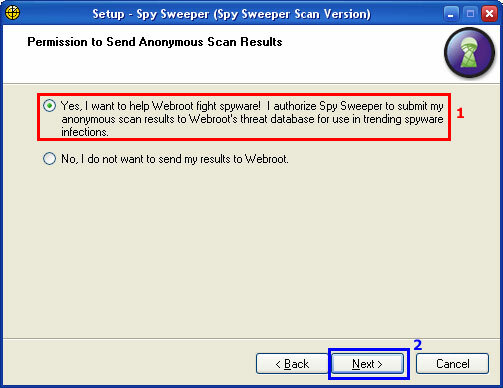 Now the setup will ask you whether you want to submit your anonymous scan results to Webroot’s threat database or not. If you choose to submit, your scan results will be used by Webroot to analyse spyware parasites and develop removal instructions for them. Although it is up to you whether you want share this information or not, it is recommended to help fight spyware by selecting Yes. Now another screen should appear. Click on the Install button. The setup will copy files and register the program in the system. Click on the Finish button in the next screen. Now Spy Sweeper is installed to your system. You may select the option Run Spy Sweeper Now. This will start the application after you exit the setup. However, this step is not required, as in next section you will learn how to manually launch the program and use it to check your system for infections. You also can view Spy Sweeper’s release notes. If you are interested, select the option View Release Notes before finishing the setup. 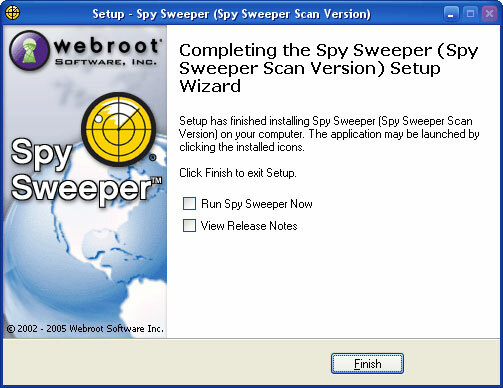 To start the program you have to double-click on the Spy Sweeper desktop icon or select the Spy Sweeper shortcut from the Start menu. This will open the program’s main window. On the very first run the application will ask you to update its spyware definitions database. Reply positively by pressing the Yes button. 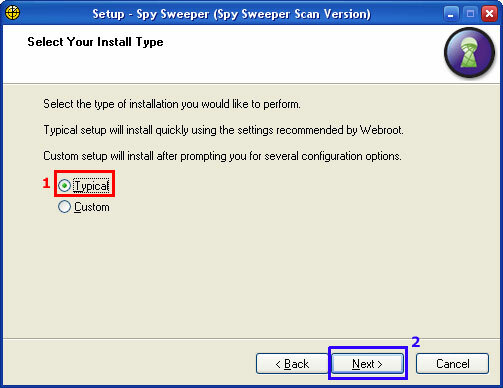 If the program did not ask you to update or you have accidentally bypassed this step, use Spy Sweeper’s default update utility. Open the program’s main screen by clicking on the Home button (on Image 6 it is designated by the green box). 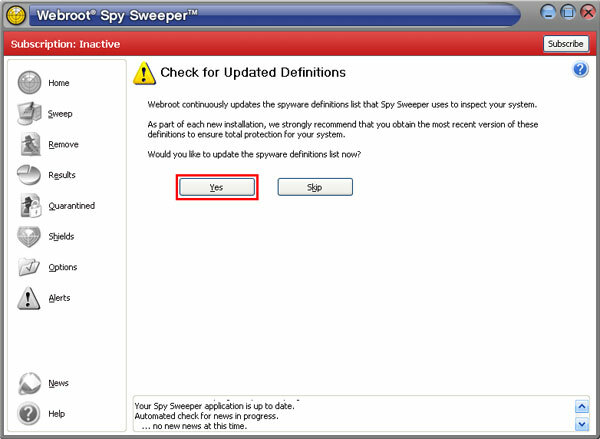 To update Spy Sweeper’s spyware definitions database simply click on the Check for Definition Update link (on Image 6 it is in the red box). The program will automatically download and install all necessary updates. The entire application can be updated in the very same way. You have to click on the Check for Program Update link (it is in the blue box). 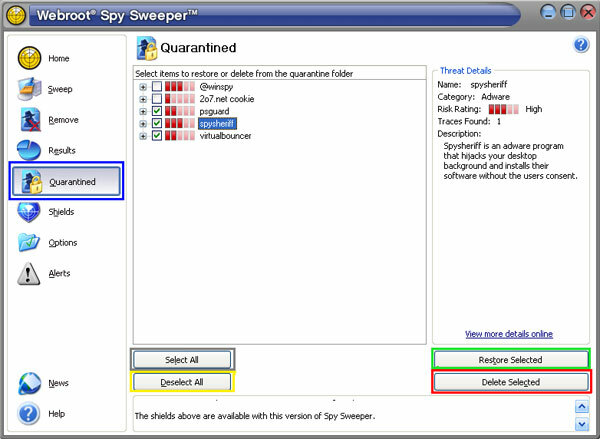 The Spy Sweeper’s scan engine can be customized to perform different kinds of scans. On the very first scan you should check the system as deeply as possible. That is why you may have to reconfigure the program. To see the current settings click on the Options button. A new screen will appear. Open the Sweep options tab in it. You will see default scan settings. Now allow Spy Sweeper to examine all your local hard drives. Take a look on the list Sweep All Folders on Selected Drives and make sure that it is selected and there is a checkmark next to each of your hard drives. Although Spy Sweeper’s default scan settings are tough enough, you can also turn on checking for rootkits – malicious objects hidden from you and the system. This will noticeably increase scan times, but will allow the program to detect dangerous complex parasites. Place a checkmark next to the Sweep for Rootkits option listed in the What to Sweep section. However, if you have a powerful antivirus program and do not wish to wait more time until system scan is finished, do not turn on checking for rootkits (recommended for most users). Now you are ready to start using Spy Sweeper. 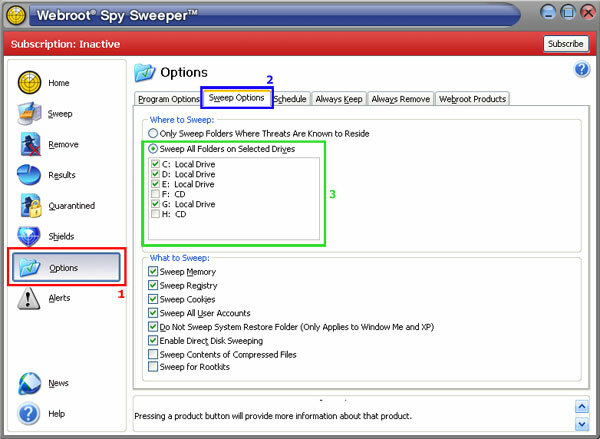 To perform your first system scan click on the Sweep button (on Image 9 it is designated by the red box). This will bring the Sweep System screen. Now click on the Start button (it is in the blue box) to start full system scan. System scan takes a while, so please be patient. After the scan is over, the program will display a scan report, which provides the count and the complete list of detected parasites and associated traces. Each item in this list can be expanded. Click on the + icon (on Image 10 it is designated by the blue box) next to an item. You will see the complete list of registry entries, files, processes and other objects related to the selected parasite. Take a look on the right pane (it is in the red box). 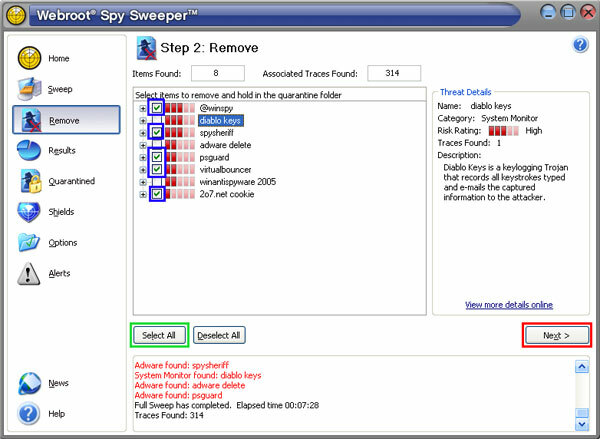 In this area Spy Sweeper provides detailed information about each found threat. 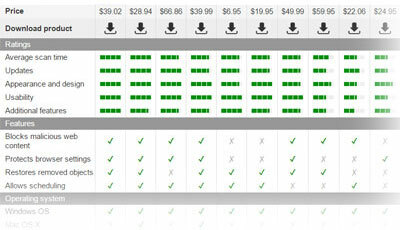 You can also click on the View more details online button (on Image 10 it is in the green box) to learn more. This will launch your web browser and open a web page providing information about the selected parasite. The limited Scan Version of Spy Sweeper is unable to remove found parasites. To enable the removal function you will have to purchase (subscribe) the program. This section is only for those users, who have already purchased the product. To remove discovered parasites from the system place checkmarks (on Image 11 it is in the blue box) next to threats you want to get rid of and then press the Next > button. To remove all detected parasites click on the Select All button (on Image 11 it is in the green box) and the press Next >. The removal process takes a while, so please be patient. After each system clean-up Spy Sweeper backs up removed objects, so that they could be easily restored later. This feature helps to repair the system in case harmless essential system components were accidentally removed. However, if you are sure that all eliminated items are malicious, you can delete them from the Quarantined list. 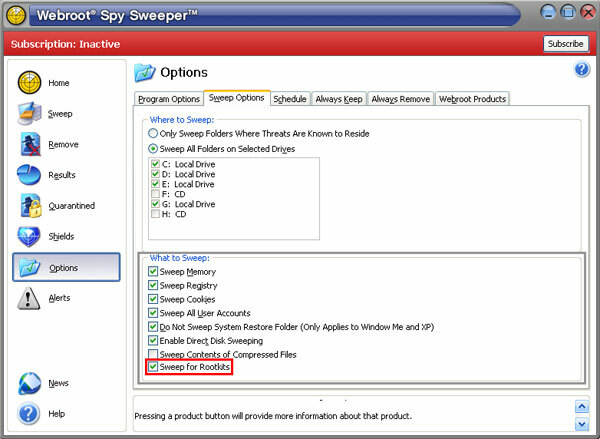 This list is Spy Sweeper’s tool that allows deleting or restoring items from backup. To access it, click on the Quarantined button (on Image 12 it is designated by the blue box). You will see the list of saved objects. To remove certain item from the quarantine, place a checkmark next to it and click Delete Selected (on Image 12 this button is designated by the red box). To restore an item click on the Restore Selected button (in the green box). To select all backed up items click on the Select All button (it is in the gray box). To deselect all currently chosen entries click Deselect All (in the yellow box). 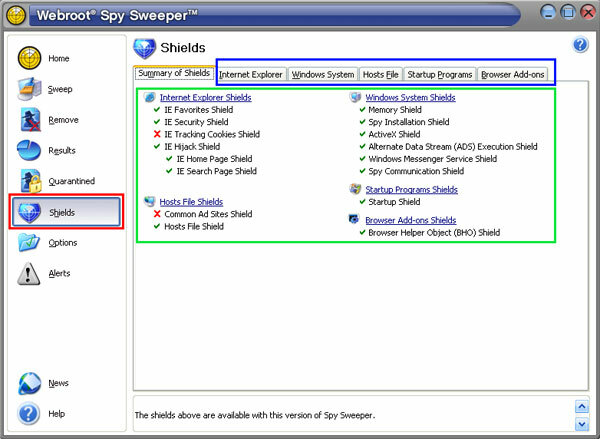 Spy Sweeper comes with an integrated set of real-time protection monitors called Shields. This set consists of several specific agents that can run independently from each other. There are fives different groups of them: Internet Explorer shields, Windows System shields, Hosts File shields, Startup Programs shield and Browser Add-ons shield. Each group has its own settings. Shields provide truly effective protection that should be present on every system Spy Sweeper is installed to. To access the Shields configuration click on the Shield button (on Image 13 it is designated by the red box). This will bring the Shields section. All present shields are distributed into groups; each group is located in its own tab (on Image 13 these tabs are in the blue box). To view current settings, alter configuration, turn on or turn off certain shields open the corresponding tab. In the appeared screen you will see shields properties. All essential real-time monitors are enabled by default and configured for optimally effective protection. I suggest leaving default configuration unchanged. To make sure your real-time protection settings are optimal, take a look on Image 13. Your Shields section should have exactly the same settings enabled as that shown on Image 13 (in the green box). Spy Sweeper is a complete anti-spyware solution, which provides all the necessary tools you need to effectively protect your computer from the most latest and also the most sophisticated spyware parasites as well as various trojans and even invisible rootkits. If you do not like Webroot Spy Sweeper, cannot afford it or simply want to use another anti-spyware, take a look on the list of our recommended anti-spyware products. This entry was posted on 2006-01-15 at 09:04 and is filed under Articles, Tutorials.